We are heading west and the last night train takes us to Ulan Ude, the center of the Buryat Republic. We meant to spent the end of our journey to Russia hiking on Svjatyj Nos, a peninsula full of bears, snakes, and hot springs. But fate and nature did not want it, and it turned out differently. At 4 am, the conductor ruthlessly wakes us up and announces our stop, Ulan Ude. We get off and with sleepy eyes head to the bus station. On the way, we meet a huge Lenin head looking over the city center. 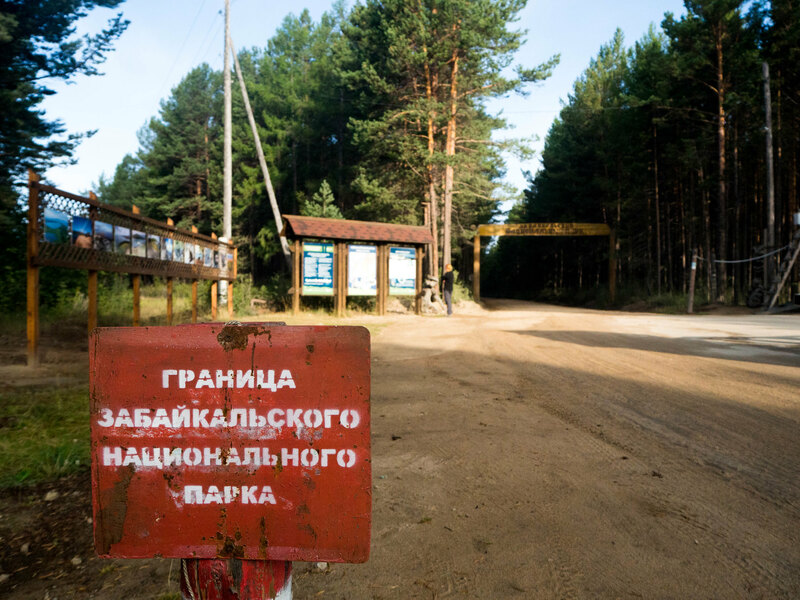 Marshrutka to Ust-Barguzin, the nearest village to the Svjatyj Nos peninsula, is crowded as usual. But the driver is obviously enjoying the ride and keeps pace with trendy Russian pop. We suppose it is new in the charts the words, which come from the radio are: “Наш Крым дорогой! НАШ КРЫM ДОРОГОЙ!” Fortunately, most of the way is paved, but the closer we get to the north, the more unpaved sections occur and we are hitting our heads on the minivan ceiling. In Ust-Barguzin we buy weekly supplies and head for a park gate, which is still 5 kilometers away. We’re arriving in the dark, but the guard is up and wants to register us. When she finds out that we are on foot, she refuses to let us go: “The nearest camp is 40 miles away, you can not sleep elsewhere! I’ll call you a taxi back to the village.” But we refuse and swear we’ll build a tent in front of the gate and head out to the park with the first sun rays. But another problem occurs in the morning. The guard tells us that there are fires in the park, and she will not let us in. Moreover, according to her words, there is only one camp and we cannot leave it. Therefore, she gives us only a three-day permit. But to make it a little easier, she helps us to find a ride and tries to get us into passing cars. Finally, a French family heading for a day trip to the highest hill of the peninsula takes us in. On the way, we pass tents along the coast, and despite the fact that ships in the bay do not have the permission to transport the tourists, they cheerfully attract us for a ride. So much of a strict ban on moving outside the official camp. The UAZ drops us 7 miles away from the camp, so we have to walk anyway. It is clear that there is no one following the rules and prohibitions, and we decide to do the same. However, the fires are vast. An airplane takes water directly from the lake and flies to fight it in front of our eyes. 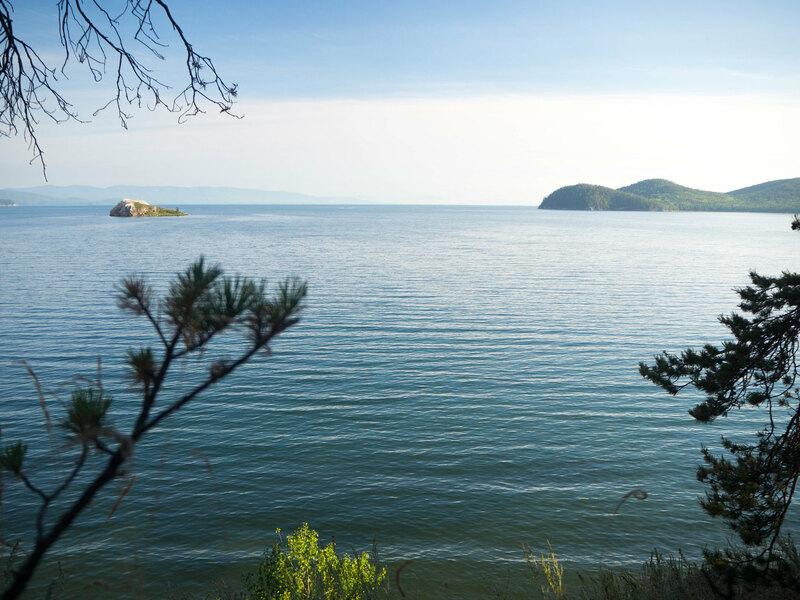 On the next morning, we head to three hot springs hidden in the Snakes bay. Lazy tourists will be taken there by a forbidden boat, we will go by a forbidden trail. As usual, we are the first ones to walk the trail this morning so we need to break through the spider webs. 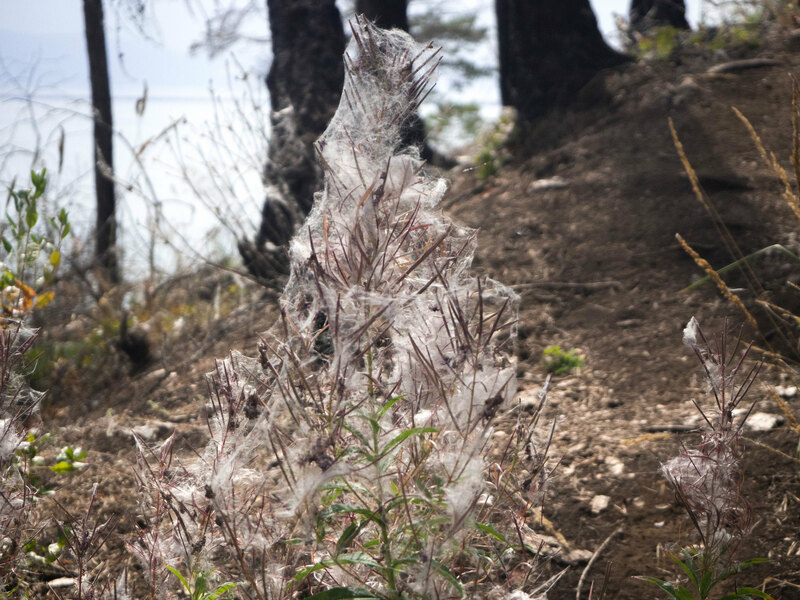 One would expect that this number of eight-eyed monsters should ensure that there are at least fewer insects, but the spiders are also on vacation at Baikal. I’m thinking about putting a mosquito net on my head, but it is in Dom’s backpack and if I opened my mouth and called him, a swarm of insects that would fly into it would be enough for a morning snack. After two hours, when we meet tourists in the opposite direction, we are finally relieved. Spider webs are gone! A group of English hikers lets us know about themselves from afar, their leader wore a jingle bell on her neck to keep off bears. We have heard and read how to avoid bears at Baikal. In the United States and Canada, the bears seem to be accustomed to the fact that tourists are making noise and such a bell keeps them away. On the contrary, in Russia where a bell or jingle bell is often attached to sheep necks, wearing such objects is very courageous. 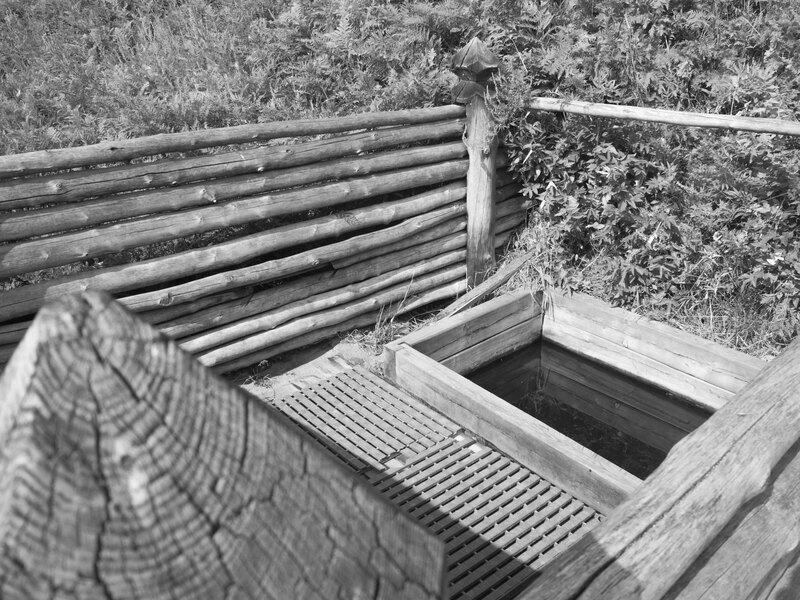 A reward in form of three differently hot thermal springs awaits us at the end of the trail. And when boats full of tourists leave, we can enjoy them only for ourselves. The Snake Bay was given its name by the occurrence of a larger number of these reptiles. Nowadays, there are only two species according to the information board. One of them is poisonous, the other is not. Therefore, when I see a snake crawl under my feet, I almost get a heart attack. 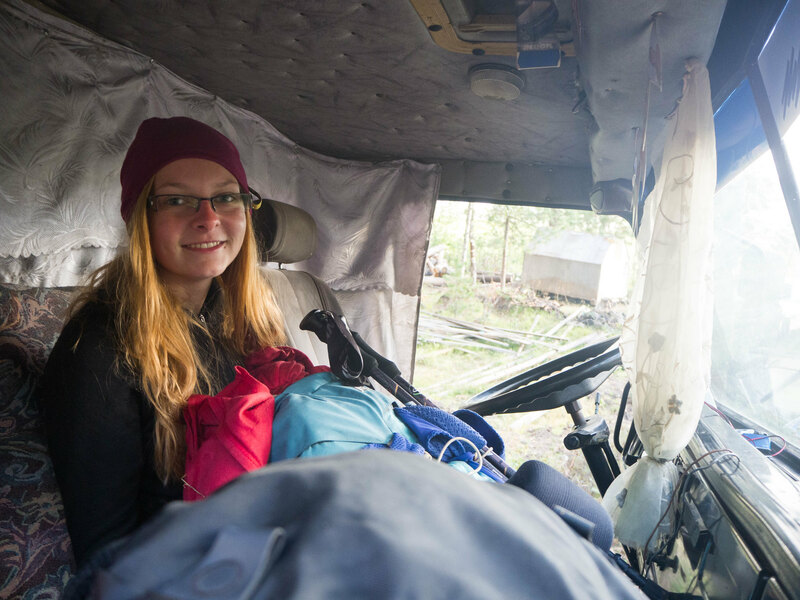 We have arranged a ride from the park with Sasha, the owner of the camp, who regularly drives to the landfill in the village to get rid of garbage. We have shortened our visit to the peninsula by more than 3 days, so we are not in hurry. Nothing keeps us from hitch-hiking back village by village. But after 15 minutes, young Buryat with his mother heading to Ulan Ude decides to give us a ride. When we mention that we are from the Czech Republic, the driver cheers enthusiastically: “Aaaa, Jagr! Jagr!” and the way is better right away. Buryats are originally Mongolians which means there is also Buddhism besides Christianity. But Shamanism has a big influence on this side of Baikal as well. 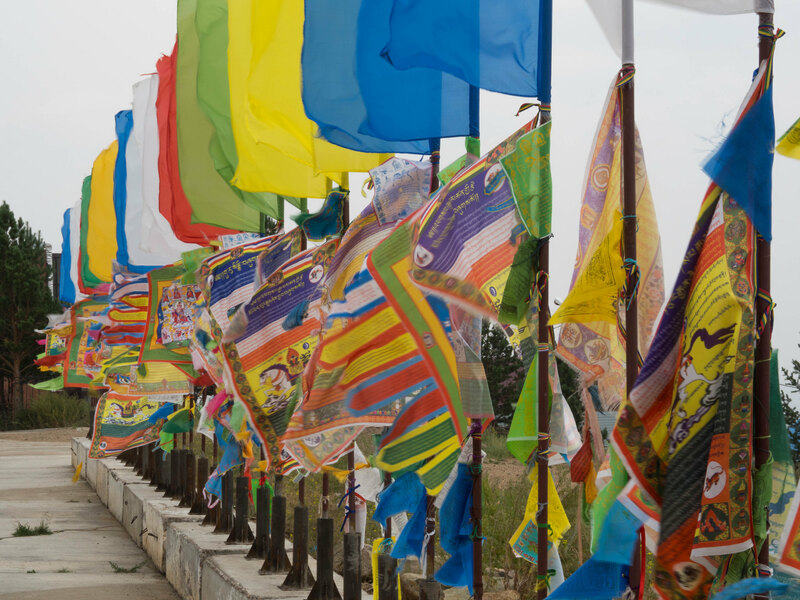 Totems with colorful scarves stand by the roads, some drivers stop to give them a tiny coin, the hurrying ones at least honk. We have decided to spend the last five days in the center of Buryatia. After three weeks on the road (and currently exactly nine days without a shower), we actually might appreciate some rest. 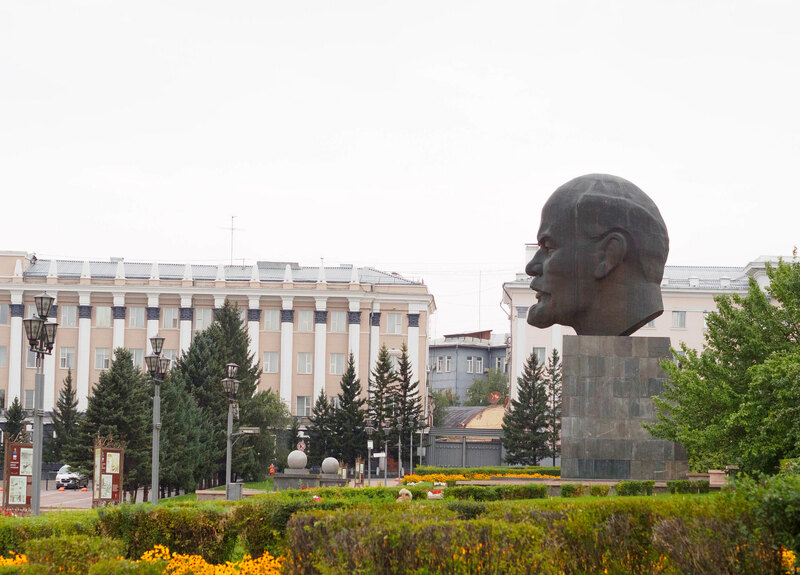 Ulan Ude – it is not only a giant head of Lenin, it is a city full of history, culture, and entertainment. Mongolian influence can be noticed even when picking from a menu – instead of our favorite pozzy, we need to order buzzy. And when a yurt peeks among wooden houses, people speak with a funny dialect, and we meet more and more Buddhist temples, which the locals call “datsan” we really start to feel like in Mongolia. However, although it is summer, the local beggars reminds us that we are still in Siberia. Some of them just lift fingerless stubs of their hands. That’s all they have left after cold winters.